The inevitable truth is that each day we get older, both dog and man, and there is nothing we can do about it. Some day in the hopefully very distant future we will all be dust. This I accept, but I do worry about this wonderful online world, full of caring friends sharing wonderful stories, shoulders to cry on, invaluable experiences, and great fellowship. Who will carry on what we have built when we are gone? Then I remember Crystal and her Mom and I feel better. Not only is Crystal a young pup who is going to be with us for a long time, but her Mom is very young, and when the rest of our Mommies are too old to use the computer Crystal’s Mom will be young enough to run the whole Internet. Crystal and her Mom are showing us old hands that we can learn so much if we would listen to our young friends. Last week, for the first time, Crystal was allowed to run free, and her Mom said that Crystal showed her that being a good dog owner doesn’t just mean keeping your dog on leash but building the trust between owner and dog to have them off leash. This insight just blew me away. And, considering that my Mom has never trusted me off leash, showed that the young have so much to teach their elders. One of our favorite Internet experiences is watching Crystal and her Mom learn and grow together. Like when Crystal’s Mom saw that Crystal liked to sleep curled up. She bought Crystal a bed but Crystal, being a big dog, laid every way possible, across it, over it, around it, but with help from her Mom she figured out how to curl up and sleep in it. That is what I love Crystal and his Mom as they both grow towards adulthood, together they are taking time and figuring out how it works. So this is for Crystal and her Mom. Someday we are going to have to leave the Internet to someone, and I can’t think of anyone pup and Mom better to trust with this huge responsibility than the two of them. Dear Tashi: I am sorry, being a Northern dog I cannot take your case. I think we should join together and sue all the dogs from the North Pole who are sending their cold air our way, and when we win we will make them drag us around in those very cool sleds. Either that or sue the groundhog. I understand he was recently cleared of blame for the late winter but we believe that was just clever work by his publicist. I shall get to filing the papers now. Dear Max: I have checked with my supervisor Attorney Foley Monster and she told me that we cannot take a case with your Mom as the defendant because of her loyalty to Tanner Bub and because she knows that your Mom did what she knew was right. Those warts can turn into something far worse and cause you to receive a premature ticket to the Bridge. The good news is, if the doctor said he would be able to remove the wart easily and he ended up taking a huge chunk out of your skin then he is liable. We sent him a settlement request of 200 assorted treats. Dear Attorney in Training Pocket Dog: My Daddy kept me off line for over a year and I missed lots of good times with my friends. Is this actionable? - Sophie Jean Boyd. Dear Sophie: You are darn right it is. I have discussed it with Foley and we are demanding that your Daddy feed you nothing but premium dog food and treats for the next week, provides for you a new toy for every toy you own that is over two years old, and takes you for at least one half hour walk a day where you are allowed to sniff whatever you want to sniff. If he does not do this then he can expect to go before Judge Judy in Doggycourt. Your fee is one premium treat. Please stay in touch if he does not meet our demands. Pocket’s Legal Tip of the Week: Recently the Supreme Court ruled against two of Foley’s clients. They were dogs who worked for the police and had sniffed drugs outside a man’s home. The police used this as probable cause to enter the house and arrest the man. The Supreme Court ruled that just because us dogs tipped the police that there were drugs in the house it was not good enough evidence for them to enter. Basically they said that us dogs could go boolala ourselves. So I advise that whatever we learn through our superior senses about what humans are doing in our house, as long as they aren’t hurting animals or humans, we let it be. If humans don’t appreciate what we do for them then they can figure out who is getting high on their own. Instead of working for the man let’s start working on our rights so the Supreme Court will recognize us as the Superior beings. And Dude, if you are getting so stoned we can smell you across the street, might be time for a meeting. I am Pocket the Thunder Dog. Daddy bought me a Thunder Shirt and he did it without Mommy’s permission. Usually when this happens Mommy announces that he’s done something stupid but this time she said he did something really stupid. Mommy is a bit cynical about the wonder products that are supposed to calm or train us dogs. But I don’t care, I have a shirt and Foley doesn’t so cool beans. Daddy put it on me. I can’t say if I felt calm or not. I jumped on the couch, rolled around, and was able to get the jacket off. Now, while this did not make me calmer, it made Daddy more anxious, because he had bought the shirt to make me less anxious and Mommy’s sharp look at Daddy when it came off me was, in the world of anxiety, known as a carrier. Daddy was determined to show her that she was wrong and that my Thunder Shirt would not end up in the drawer with the Bark Off, the clicker, and the condoms. You know, the drawer full of stuff that will never, ever, ever be used again. Daddy put it on me again and then read the directions. I guess this is the “Men’s Way” of doing things: Do it then read the directions. Then he took it off because apparently putting it over my harness was incorrect, removed my harness, and put the shirt on me. Then he took the shirt off because he read the second paragraph of the directions that said to introduce me to the thundershirt by putting a treat on it. So he took it off, put a treat on it, and asked me to eat the treat. I ate it, but it was like asking a human to eat a steak off a shirt they were just wearing. Anyway, I found the entire thing very stressful. Then he read more directions. It said I should wear the shirt for a short time on Thursday so I could get used to it. So I did. Then, on Friday, before Mommy and Daddy went out, they offered me a treat, and while I was crunching my treat they strapped the shirt snuggly on me. Realizing they put the shirt on me because they were leaving I became nervous and spit out the treat. Another epic fail. Then I got put in my crate. The biggest reason they bought me a thundershirt is because, when I am left alone, I drool a river in my crate. I get very worried, then very excited, and the blanket I lie on becomes soaked. It’s like I am wetting the bed but not with pee, with worry. I, even with a thundershirt, still drool a river. but maybe a slightly lesser river. When Mommy was out with her grandbabies at dance practice and I stayed with Daddy I still trembled, but maybe not as much. When the grandbabies came in I still freaked out zooming around the house, but maybe a touch less zoomy. Right now the jury is out on my thundershirt although I do like it because it is snuggly. But when you sleep between Mommy and Daddy under the covers at night knowing that nothing can ever hurt you, a shirt can’t take the place of that safe feeling. I want to see if they make a Mommy never leaves shirt. That would be a big seller. There are some pups who I don’t remember not remembering. It seems like I have been friends with them longer than I have been alive. I don’t know if there is a place like Rainbow Bridge that we gather before we find our homes but I think I was there with some pups before coming here. One of those pups was Gizmo. I don’t know if we became friends on my first day at DS. I think it is possible. I made lots of friends that first night. I just know I have never belonged to a site that Gizmo was not a member, and my Mom is friends with Gizmo’s Mom, Aunt Pam, all over the Internet. Some pups get sick, or their parents find lumps, and go to the vet, where they battle their disease for a long time. Sometimes friends recover, and sometimes the Bridge calls them home. Although it doesn’t really help when we know we are able to prepare ourselves if their call to the Bridge comes. But other times the trip to the Bridge arrives quickly, and we are barely able to prepare ourselves. This was the case with sweet Gizmo. It began with the yearly checkup. They become very routine. We get squeezed, crammed, felt up, probed, stuck, and sent home. But on this trip, when they went to draw blood from Gizmo, he had a seizure. I guess, if you are going to have a seizure, there is no better place than the vets, who were able to take an x-ray immediately. But the results of the x-rays were not good. Gizmo had an abnormal growth on his windpipe. 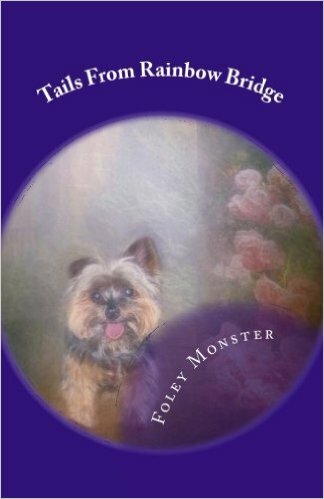 When Aunt Pam shared this story on the Human Book she said “We know our pets age, and as much as we think we are ready for the day they go to the rainbow bridge, I realize tonight how unprepared I am for that.” But she swore she would not let her little angel suffer. 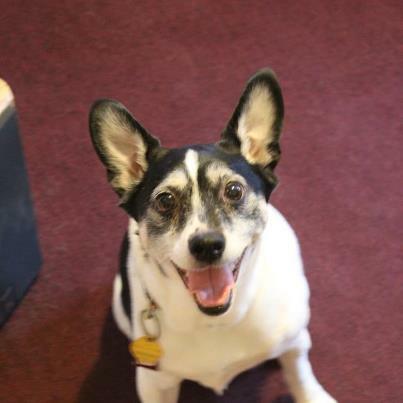 “Gizmo has been an amazing addition to our family and provided so much love,” she said. She asked, and received prayers from all our friends that the specialist would report good news. We all love you Gizmo. We are glad your pain is gone. We wish we could take your Mom’s pain away. We will be blowing kisses to the heavens tonight for you my brother. We know you will joyfully be chasing them down. I Foley Monster would like to file a missing person’s report. The missing person is known as Mr. Spring. Now I know according to our calendar Mr Winter is still taking up residence in our state but usually Mr Spring at least gives us a hint that he is coming. He is supposed to arrive tomorrow, but when we awoke this morning we found Mr Winter still here showing no signs of wanting to leave. He had spread his snow all over our lawn, he put his ice on the driveway, and he had the air where we live very cold. All signs of a Winter in residence. We aren’t the only ones who are longing for spring to make an appearance. When we go in our yard to do our business the flowers poke their shoots up and ask us if there is any word from Mr Springs and we sadly shake our heads, shiver, and go about our business. Reading some of my friend’s blogs I know Mr Spring has turned up in their neighborhoods and I am very happy for them but I don’t know what we have done to make him feel unwelcome. I suggested Daddy go out and work on the lawn to show Mr Spring he is welcome but Daddy says he is going to wait for Mr Spring to arrive before doing it. Sometimes Daddies make no sense. Pocket and I are asking our friends who have been visited by Mr Spring to ask him about moving up North. Meanwhile we are doing whatever we can to chase away the guest that won’t leave, Mr Winter. When we go outside we bark and growl at the air and pass gas to try to warm up the atmosphere the way that cows do to make it more welcoming for Mr Spring. But still nothing. I am very worried about him not coming. When spring comes Mommy stops breaking her back cleaning the inside of the house and begins breaking her back working in the garden. While she is doing that Pocket and I sit in our buggy, enjoy the sun and the fresh air and make sure Mommy puts her bulbs neatly in a row. Instead we spend our days walking on the wet, cold grass. When we come to puddles Daddy picks up our leashes and we glide over them like Yorkie floats in the Macy’s Thanksgiving Day Parade. Each morning we wake up, look out the window at the grey sky and sigh. Please come home Mr Spring, we promise we won’t get upset when your pollen makes us sneeze or chase the bunnies you bring with you. Squirrels are still off the table. This week we received the sad news that our friend Willie, who I have written about recently, had a recurrence of his cancer. Right now his parents are counting on a miracle. But they shouldn’t give up hope. Because we do have proof that miracles happen. Moose has a blood disease the is quite deadly. I think it is the same one that took Mollie from us. It is very bad and hard to cure. Less than a month ago Moose had a recurrence of this disease and his his prognosis was quite dire. On February 24 his Mom could tell, the way Moms can tell with us Pups, that he wasn’t feeling well. She started him on a bland diet hoping that it would help. She took him to the vet who tested his blood. A normal PCV should be between 37 and 55 percent. Moose’s was down to 18 percent when his Mom dropped him off at the vet and had risen to 23% when she picked him up. He was diagnosed with Autoimmune hemolytic anemia. The doctor recommended a blood transfusion, but it was very costly, and the odds weren’t with Moose. His Mom, who is studying to work in animal medical care decided to count on prednisone and a miracle. Over the next four days his numbers continued to sink as low as 12. Moose was lethargic, not eating, not playing, no energy at all. His parents were hand feeding him anything they could think of to make him eat: Cheeseburgers, minute steaks, liver, cheese, along with prednisone and Doxycycline for his health but his condition was not improving. His mucous membranes turned from pale pink to white, a very bad sign. On the night of March 3 his breathing became labored and his parents prepared themselves for his inevitable trip to the bridge. But the next day Moose rallied. He ate that night without having to be hand fed. There was some pink back in his gums. For the first time in a week he showed interest in dry food scoffing down Sydney’s supper as well as two small hamburgers. Moose’s parents prayed he was taking baby steps back to good health. A couple of days later Moose was back to being himself even charging into the snow to play. He didn’t have the energy to do so for long but the will was there. His appetite came back stronger than ever and his parents began to believe his was on the upside of the disease. A week and a half after his parents brought him home prepared for his trip to tbe Bridge Moose was doing very well. They took him to the vet on March 9 and his PCV levels had risen to from 12 to 29, still in the danger zone but rising, and his total protein was up to 7.4. While Moose needs prayers to keep improving the fact that he is still with us is a miracle, one both Moose and his parents deserve. He received hundreds of prayers from his social network friends and his parents are convinced they aided greatly in his recovery. So, while Willie, and some other friends might need a miracle, never give up hope, because sometimes, like with Moose miracles do occur. Keep it up Moose, you are an inspiration to us all. And we will keep praying for miracles. Announcer - This is the plaintiff: She is known as Dougall’s and Floyd’s Mom who writes this blog. She came home one day to find her boxer Floyd eating the carpet and put him in his crate. She says he has misbehaved and lost his chance at freedom. This is the defendant: Floyd who is represented by Foley Monster Attorney at Paw. Floyd says he was just inspecting the carpet when his Mom came home and found him. He claims he did nothing wrong and was framed. He is accused of being a carpet eater. Bird: Grumble, grumble, all rise. Judge Judy: Are you Mr. Floyd? Floyd: Yes I am your honor. Judge Judy: And this Miss Foley Monster she is your attorney? Foley Monster: That is right your honor. Judge Judy: Well Mr Floyd I wish you luck. Miss Foley Monster is no stranger to this court and I don’t think she had won a case yet isn’t that so Miss Foley Monster? Foley Monster: I believe that was beginner’s unluck. Judge Judy: Well we shall see about that. Now, Floyd’s Mom, you had some carpets damaged and you believe the defendant is responsible. I will hear you now. Floyd’s Mom: I came home one day and I found the carpet was ripped up and Floyd had a large strip of carpet in his teeth. Judge Judy: Do you have any witness to the crime? Floyd’s Mom Yes I have his brother Douggal. Judge Judy: Douggal will you please tell the court what you saw on the date in questoin. Douggal: I saw Floyd ripping apart the rug with his teeth. Floyd: Mom always liked you best. Douggal: That’s because I don’t eat the carpet. Judge Judy: ~Sharply~ Do not address one another. Do you have anything else.? Judge Judy: All right Miss Monster we will hear your side. Foley Monster: Judge, we will capitulate that Floyd’s Mom did come home and find him ripping apart the rug but she did not know the reason why. Your honor Floyd’s Mom’s house has been infected by carpet bugs. Judge Judy ~Leans back, bug eyed with a stunned expression ~ Carpet bugs? That’s ridiculous. There are no such thing as carpet bugs. Don’t pee on my leg and tell me it’s raining. Foley Monster: That was my sister Pocket Dog with the peeing problem your honor. She’s almost got it licked. Judge Judy: I don’t want to hear about your licking Foley you understand me? Now back to this ridiculous claim of carpet bugs. Foley Monster: They are real things your honor. They came about when bed bugs mated with carpenter ants. They are under a lot of carpets. Do you have any carpet in the courthouse? Bird: Your office has carpet, grumble, mumble, grumble. Judge Judy: Fine. We will go to my office and check the carpet. Judge Judy: All right Mr. Floyd. You seem the be the expert carpet eater but if there is nothing found your Attorney is going to pay for my new carpet do you understand that Miss Monster? Foley Monster: Yes your honor. Judge Judy> All right Mr. Floyd, eat away. Foley Monster: There it is your honor. Carpet bugs. Bird: Does are bugs mumble grumble. Floyd’s Mom: Oh my Floyd were there really carpet bugs under the rug? Floyd: ~Looks back and forth confused,~ Yes. Yes those are the bugs I was looking for. Floyd’s Mom: I am so sorry Floyd. Let me take you home and give you a treat. Judge Judy: Congratulations Foley Monster I believe you have won your first case. Bird get someone to replace this rug. Foley Monster: Judge Judy do you mind if I use your office to call my Mom for a ride home? Judge Judy: I suppose but don’t pee on the floor and tell me it’s raining..
Foley Monster: Thank you Judge Judy. ~Under her breath~ That pee thing isn’t old. ~They leave. Foley whistles for Pocket who comes out from under the desk.~ You did a great job with the bugs. Where did you get them from? Pocket: I ordered them online. I had to hide them before the trial. Foley Monster: Where did you hide them? Pocket: Under the rugs at our house. Foley Monster: ~Hits herself in the head with her paw.~ Oh Pocket Mom is going to kill us. We need to rip up the rugs. ~Thinking~ Floyd? Sharpen your teeth. It’s time to pay your legal fees. This story goes all the way back to before Thanksgiving. And like Chelsea it came about because a growth was found that had to be removed. Unlike Chelsea the news from the beginning was dire. Summer was diagnosed with stage three mast cell cancer. This was in the middle of her parents moving. With the upheaval in their lives the last thing they needed emotionally and financially was for their beloved Summer Grave to take ill, but sometimes life plays mean tricks. Summer had one surgery, then went back to the vet where her parents were given news that did nothing to encourage them. They could do another surgery to widen the area of tissue they took then follow up with prednisone, or start either chemo or radiation. There was a very good chance that the growth removed in the first surgery would come back. While at the vets they did a test of her lymph nodes and got a rare bit of good news when the lymph nodes showed no signs of cancer. Her parents decided to take Summer to a new vet and were hoping for a good visit. They anticipated that she would greet the vet with “hiney wiggles and lots of prayers.” Unfortunately they did not get the news they were hoping for. Summer then saw Dr Quigley. The doctor thought with another surgery Summer would have a better chance for a full recovery.. And the doctor inspired confidence in Summer and her Mom by getting on the floor with Summer and gratefully receiving kisses. The decision was made to have Summer undergo a laser surgery to widen the margins of tissue taken. Dr Quigley said she did great. Summer had a ten inch incision, nine inches longer than her previous one. on her undercarriage. They found a nodule at the site of the original mast cell and removed it. She was put on prednisone, an antibiotic and a steroid. The doctor hoped, if kept quiet, Summer could heal from the surgery in two weeks. For the first few days everything went well She was healing nicely, eating well, and did not have any reactions to the prednisone or the antibiotics. She went on a walk, met her neighbors and checked out some deer droppings. The sewing stitches were removed and the doctor said to continue her on the Prednisone. But, as we all who love, try to care for, and keep from hurting themselves know, dogs are the worst patients. After getting her stitches out Summer jumped from the recliner to greet her Dad at the door and split open her entire incision. Her Mom’s heart broke as she saw the wound open again. She put gauze on it, wrapped her in a white towel and took her to Dr Quigley who had to staple her back together. The prednisone was hampering the healing and it would be another three weeks of trying to keep her quiet until she could back to her active, fun loving ways. Then she went back to Dr Quigley for even more staples. Everything a pittie does, from barking to eating, is powered by their undercarriage, and those muscles are always in motion, If the staples don’t work then she would have to regrow her own skin and it was doubtful she would grow hair in that spot. Plus she had to wear a t-shirt to cover the incision so the staples did not get snagged. Her Mom and family did not have a high confidence that the staples would heal the incision. A few days later the incision opened again at it’s widest part. Her poor Mom was at wits end, saying she had never seen anything so hard to heal in her life. It became more likely that Summer would have to regrow skin. She had been cut down to one prednisone a day. She also was putting peroxide on the incision but didn’t want to put anything else on it because she was afraid of loosening the staples. A few days later Summer began to improve. She was able to jump on the bed for the first time in months. Her incision was healing nicely and the skin was starting to grow. She was turning the corner. Then Summer’s Mom got a tip from Chappy’s Mom Vicki who told her about Vetericyn. She put it on Summer’s incision and the next morning she saw healthy tissue growing in the exposed area of her incision. Summer was even acting better. A few days later Summer had her staples taken out by Dr Quigley who said the healing looked good and the granulation in the center was healing nicely. Summer was on the road to recovery. Now what Summer needs is our prayers. If she can make it through May without a recurrence of the cancer then she should be in the clear. She has made it so far, and through so much, it just wouldn’t be fair if she wasn’t back to being her happy, normal self soon. For those of you who have been praying right along I know you will keep it going, and any new prayers will be appreciated, so Summer can enjoy some very long Summer days. As many of you know our long time nemesis Michael Vick was allowed to get a dog. I don’t want to anger anyone but I don’t see the problem with this. In the aftermath of World War One Adolf Hitler was allowed to rearm Germany and that worked out fine. Hold on I am getting a note from Pocket. Oh, it seems that worked out badly. Very, very badly. Well, this is America, and people do deserve a second chance. Like that quarterback, can’t think of his name, he played with the Falcons, and was the first pick of the draft. In the beginning he played well, but then things started to fall apart. He got in trouble with some illegal substance at the airport. Later he got arrested and went to jail for a reason I can’t recall. He got out of jail, went to a new team, had a great season, and then two terrible seasons after that. Wait, getting a note from Pocket. Oh, he was named Michael Vick too. Wow, what are the odds? So Michael Vick, the man who ran a dog fighting ring from his house, has been reformed and has a new dog. Well that’s good news. I know he is going to be a good parent because I saw a picture of him attending training classes with his dog at Pet Smart. I don’t have a problem with Pet Smart. Any store whose employees allow dogs to put their paws on the tiles and don’t care if we pee on it is aces with me. Good food, good toys, good clothes, good people, good training classes, good everything. I gave it five bones on Yap! I’m just wondering why Michael Vick took his dog there to be trained. So, Mr Vick, I must say I am not any more impressed with your second chance as a pet owner than I am with your second chance as a football player. Seems like, in both instances, at the beginning, you did all the right things, but now you are in your second season as a dog owner, and instead of doing what is best for the team, wife, kids, and dog, you are doing what is best for you, getting your picture in the paper showing what a good dog owner you are instead of being a good dog owner. I predict that your comeback as a dog owner will be just like your comeback as a football player: In the end, failure. But, in football, only your team loses. I’m afraid in this comeback, something much more precious will lose a whole lot more.